The leader of the militant Islamist group Boko Haram is said to be a fearless loner, a complex, paradoxical man - part intellectual, part gangster. Fondly called imam or leader by his followers, Abubakar Muhammad Shekau was born in Shekau village in Nigeria's north-eastern state of Yobe. Some say he is 34 or 35, others that he may be 43 - the uncertainty adds to the myths surrounding Nigeria's most wanted man. Mr Shekau was once thought to have been killed by security forces in 2009 - only for him to reappear in videos posted on the internet less than a year later as Boko Haram's new leader. The group's founder, Muhammad Yusuf died in police custody, and hundreds of others were killed during that massive crackdown - which many blame for making the group even more violent. Mr Shekau has not been seen in public since. Instead, still images and video clips of him are released from time to time, mostly online, by the group's faceless "public enlightenment department". 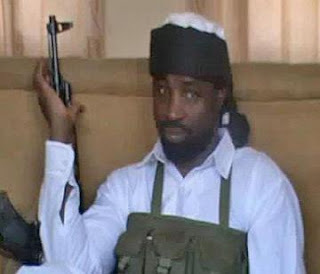 Mr Shekau is said to have met his predecessor in Maiduguri, capital of Borno State and now Boko Haram's headquarters, through a mutual friend, Mamman Nur. Nigeria's authorities say Mr Nur masterminded the August 2011 bombing of the UN office complex in Nigeria's capital, Abuja. All three were theology students - and Mr Shekau was seen as the quietest and perhaps the most radical of them. "He hardly talks, he is fearless," says Ahmed Salkida, a journalist with such good access to Boko Haram that, at one stage, he was suspected of being a member. He says he only escaped summary execution by Maiduguri police after an intelligence officer intervened. "He is one of those who believes that you can sacrifice anything for your belief," Mr Salkida says. Mr Shekau is fluent in his native Kanuri, Hausa and Arabic languages - he does not speak English. "I used to joke with him that he should teach me Arabic and I would teach him English," Mr Salkida says. When Yusuf was killed, Mr Shekau is said to have married one of his four wives and adopted their children - perhaps, say sources who do not want to be named, to preserve Boko Haram's cohesion or "purity". The group has a highly decentralised structure - the unifying force is ideology. Mr Shekau does not communicate directly with the group's foot soldiers - he is said to wield his power through a few select cell leaders, but even then contact is minimal. "A lot of those calling themselves leaders in the group do not even have contact with him," Mr Salkida says. Mr. Shekau has neither the charismatic streak nor the oratorical skills of his predecessor - but he has an intense ideological commitment and ruthlessness, say people who study the group. "He is the leader of the more militant wing of the group as testified by his aping of Osama Bin Laden in his video appearances," says Abubakar Mu'azu from the University of Maiduguri. Mr Shekau issued a chilling message in one of those appearances - which provides an major insight into what his leadership of the group will bring. "I enjoy killing anyone that God commands me to kill - the way I enjoy killing chickens and rams," he said in the video clip released just after Boko Haram had carried out its deadliest attack so far, killing at least 180 people in Kano, northern Nigeria's largest city. Mr Shekau is also the group's spiritual leader - and, judging by video footage, he seems equally comfortable delivering sermons to his followers. "He has a photographic memory and is well versed in theology," Mr Salkida said. He is nicknamed "Darul Tawheed", which translates as a specialist in Tawheed. This is an orthodox doctrine of the uniqueness and oneness of Allah, which is the very cornerstone of Islam. But Nigeria's mainstream Muslim clerics do not regard Mr Shekau as a scholar and question his understanding of Islam - and regularly condemn the bombings and drive-by shootings committed by his followers against anyone who disagrees with them. I'd say, anyone who enjoys killing should be feared. Where do we go from here? His eyes alone sef are scary. God save Nigeria! Na wa o, so we now have our very own OSAMA BIN LADEN! lol! @ our very own BIN LADEN. I just hope the US doesn't finally add Boko Haram to their terrorist list or else it'll become even more impossible to travel out of this country! Which i'm sure a lot of people are thinking of considering the state of things!